I mod, you mod, we all are mod! This was one of my first experimental mobiles that used recycled petals. It is a great idea, but colors were limited. So then I got a new plastic that turned out fantastic, kid-friendly, non toxic and made in Germany. Plus lots of colors. 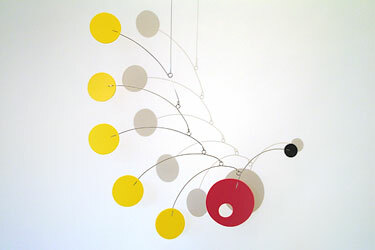 It was also the first mobile I made that came in different sizes. A great first baby mobile. Also small and medium sizes are available in EVA foam... see colors, top right.